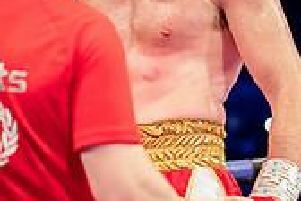 Commonwealth middleweight champion Sam Sheedy says title rival Liam Cameron doesn't have enough guts to take the belt off him. The Sheffield fighters will clash in their home city’s Ponds Forge Arena on October 13, with southpaw Sheedy’s title up for grabs. ‘Speedy’, who picked up the Commonwealth strap in a harder-than-expected encounter against Nigeria’s Abolaji Rasheed in April, says it will be third time unlucky for Cameron, who has fallen short twice previously in Commonwealth super-middleweight encounters. “Liam is a talented boxer, and technically better than Rasheed, but the difference is he hasn’t got as much b***s,” stated the 29-year-old..
“Liam likes things his own way, like a lot of people do. When things don’t go his way, he goes into his shell and pops his jab out, and goes on to the ropes. "In his 20-odd fights, he’s always been the same, and things aren’t going to change now. He’s going to do exactly what he’s always done, he’ll come out, have a go, but then be bewildered by my style. “He struggles at the weight too. He says he has a nutritionist, but it’s still going to be tough work. "His need for food won’t change, he’ll still go to the fridge, still be nicking chocolate. He’ll make the weight but he’ll be dead at it. "There’s no way he’ll be too big for me; I’m a lot stronger than I seem, and light-middleweight was too small for me. Even if Liam is alright at middleweight, I’ll still bash him up! " said the Wisewood fighter. "I’ve sparred with him and he didn’t cause me any problems, and he was in training for a fight then. “I might seem over-confident, and some people might say I’ll eat my words but I won’t.
" I need to stick to my discipline, and when the opportunities come I’ll take them. I’m not going to put a prediction on the fight apart from to say that I’ll win this fight, whether it’s by stoppage, knockout or points.